The Middleware track in this event offers you a choice. This track starts with a look at IoT in the enterprise and an examination of three different architectures that incorporate the Oracle IoT Cloud Service. The next session drills down into a reference architecture that includes the IoT Cloud Service, plus Oracle’s Integration, Process, Big Data, and Mobile Cloud Services, and presents a demo showing the development of a vending machine case. The third and final IoT session shows you how to connect devices to the IoT Cloud Service and how to use Stream Explorer to display sensor data from those devices in a web application. This track presents three in-depth technical sessions covering different aspects of WebLogic 12.2.1. The first is an extensive, code-driven introduction to developing Java EE 7 applications with WebLogic 12.2.1. The second session digs into WebLogic Multi-Tenancy fundamentals, and the final session shows how you can take advantage of WebLogic Server Zero Down-time Patching. Can’t make up your mind? No worries! All VTS sessions are available on-demand after the live event. Call for Papers: Session proposals are being accepted for future OTN Virtual Technology Summit events. Submit your proposal for Middleware track sessions in the OTN Virtual Technology Summit Middleware Ideas Space, part of the OTN Community Platform. Watch the Twitter hashtag #OTNVTS for the latest information. Speak Up! As always, your feedback is essential to the success of this publication and of OTN in general. If you have comments or suggestions regarding this newsletter or any of the resources for middleware pros available on OTN, please share your thoughts: bob.rhubart@oracle.com. Four times a year the Oracle Technology Network will be producing a Virtual Technology Summit. Hear from Oracle ACEs, Java Champions, and Oracle product experts as they share their insight and experience (through technical demo’s/presentations and hands on labs) in meeting today’s IT challenges in the upcoming Oracle Technology Network Virtual Technology Summit. These interactive, online events offers four technical tracks, each with a unique focus on specific tools, technologies, and tips – Java Track and Middleware Track. 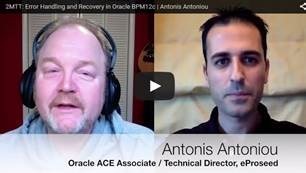 Oracle ACE Associate and eProseed Technical Director Antonis Antoniou puts the pedal to the metal with this tip on two new developer-centric error handling and recovery features in Oracle BPM12c. Watch the video here. Business Process Management (BPM) Suite 12.2.1 is a complete, unified platform that enables customers to deliver against their business process strategy, execution, and automation needs, from business architecture modeling to business and IT delivery of process solutions. · Business Architecture: model starting at the highest (Level 0) level of process abstraction, using Enterprise Process Map, Value Chain Models, Strategy Models, with the ability to link to BPMN processes, as well as to generate an Enterprise KPI Heat Map, Documentation, and Process Reports. · Collaborative Business Modeling: model specific processes using the BPMN 2.0 notation, offering both Business and IT the right tools for collaborating from modeling to execution. 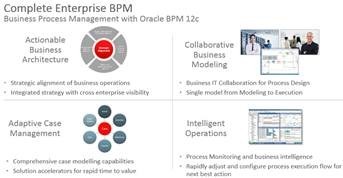 While Oracle BPM Suite version 12.1.3 has delivered completely new areas such as Business Architecture, version 12.2.1 makes this complete set of BPM functionality more easily consumable by external solutions and integrated with WebCenter 12c Content and Portal, jointly released with BPM. BPM Suite 12.2.1 includes a full set of REST API that enable applications built with any technology to leverage BPM Suite as an engine for workflow management, service integration, and process orchestration. This model is particularly well suited when custom mobile apps need a process engine that offers full BPMN and ACM capabilities, and that delivers BAM dashboards to enable control, management, and continuous improvement of processes. Specifically, version 12.2.1 adds more granular task control, whereas users of any application / mobile app linked to BPM Suite via REST can now execute and withdraw, escalate, approve, reject, etc. tasks managed in BPM Suite. BPM 12.2.1 has also extended the set of REST API that enable Case control (ACM). BPM Suite 12.2.1 includes user interface (UI) components that can be embedded in WebCenter Portal. These include Task List, where Portal users can access tasks assigned to them by BPM, and Application List, where Portal users can launch BPM applications for which they have been enabled. These BPM UIs can be imported as a Portal Resource Catalog, then embedded into any Portal page, and easily configured based on a set of most common parameters. The User Experience for BPM Suite 12.2.1 is now available with the all-new Oracle Alta UI system, adopted by the most recent Oracle Cloud, on premise, and mobile applications. For more information please visit the BPM page here & our community workspace here.